BENTON, Huge Garage Sale, 285 Creek Dr 04/25,4/26&4/27, 9:00AM-5:00PM, Dresser, Chest of drawers, fireplace, figurines, bed/bath, Christmas, file cabinet, Bookshelf, wall decorations, clothing, shoes, many more items too many to mention. 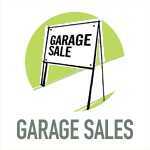 Garage/Estate Sale: Thursday, April 18 & Friday, April 19, 9-5, assorted household, Christmas, angels and dolls. 5924 Dwight St., Boscobel.